PepsiCo has placed the largest order for Tesla Semi trucks yet, reserving 100 units. The electric big rigs will join PepsiCo’s existing fleet of nearly 10,000 diesel semis to serve specific routes in North America. 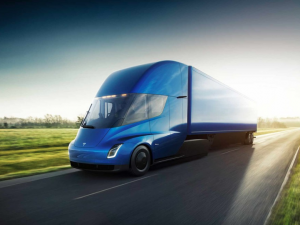 PepsiCo is the latest company to place an order for Tesla’s upcoming Semi, which was unveiled in November alongside the 2020 Tesla Roadster. PepsiCo follows Wal-Mart, J.B. Hunt, Anheuser-Busch, and food distributor Sysco in placing Tesla Semi orders. Reuters reports Tesla has received 267 reservations so far. Initially, Tesla charged $5,000 per truck to place a reservation but that has since risen to $20,000. PepsiCo intends to use the trucks for shipments of beverages and snacks foods from factories or distribution centers to retailers, and is currently deciding which routes would best suit the electric semis. Tesla claims the Semi has a range of 500 miles when towing a full 80,000-pound load, and that 400 miles of range can be restored in just 30 minutes at one of its new Megacharger stations. While 267 trucks sounds like a lot, it’s just a drop in the bucket compared to the 260,000 Class-8 heavy-duty diesel trucks produced in North America each year. 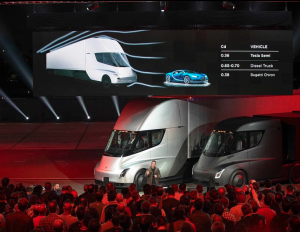 Reuters suggests the relatively small orders placed by companies so far reflect the industry’s uncertainty about electric trucks replacing diesels. 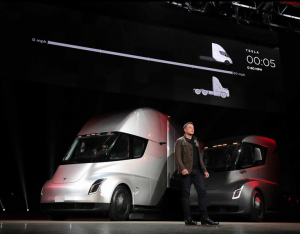 Tesla’s ability to fill large orders of trucks may also be a factor in the companies’ decisions. The automaker continues to struggle with production of the mass-market Model 3, and is far behind in deliveries. Tesla has also been burning through cash at an astounding rate, and recently posted its largest quarterly loss yet. 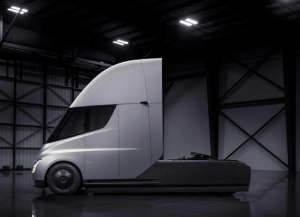 Still, Tesla says production of the Semi will begin in 2019.